Whether you’re in the market for original, outdoor, field, or road boots, Chippewa has what you’re looking for. They take pride in their heritage by continuing the Chippewa tradition of creating handcrafted American made boots that offer modern durability, while retaining the vintage inspired look. The Chippewa people believe that American craftsmanship and use of premium raw materials is the key to quality boots. Their signature label of “Handcrafted in the USA” still accompanies all of their products. Our Chippewa boots reviews will reflect a thorough investigation into what makes these boots stand out, and why they deserve to be on our list. Chippewa designed this easy lace-up with D-ring lacing hardware, leather shaft boot, in a hand crafted chocolate Apache leather. In addition, the leather is not only soft and flexible; its rich color provides a stylish flair while retaining its masculinity. These boots are not only tough enough for pounding the pavement but soft enough to keep your feet comfortable during the process. The Vibram traction sole grips firmly on less than perfect terrain; a removable comfort cushion provides extra padding for your feet. Lightweight and flexible, not heavy and clunky. It’s a nice feature if you’re on your feet for long periods. Break-in period is a slightly longer than you’d prefer, however, the high-quality leather is thicker than most. We suggest wearing a heavier sock until they are worn in properly. 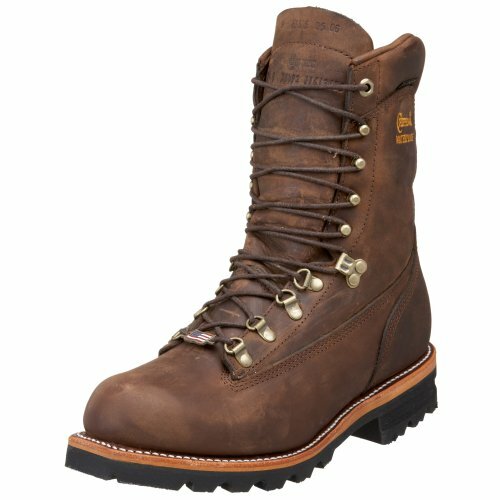 This particular model of Chippewa boot is not designed for snow or extremely wet weather. The traction on the sole is not deep enough and the boots are not waterproof. 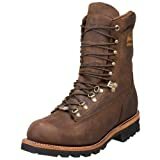 However, you can apply a water resistant application which will work on the leather, but if you need boots for snow, we would suggest another selection from the Chippewa boots brand. Or you may check the list of ice fishing boots, we listed for extreme weather conditions. If you’re in the market for a top brand boot, that offers comfort, durability, and style, this boot is perfect. 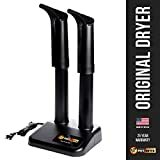 Though, their not designed for certain weather conditions, ideal for the man who needs that additional support while working on concrete floors in warehouses, or contractors who constantly walk from job site to job site. Be sure to check out our other boots for concrete floors page. 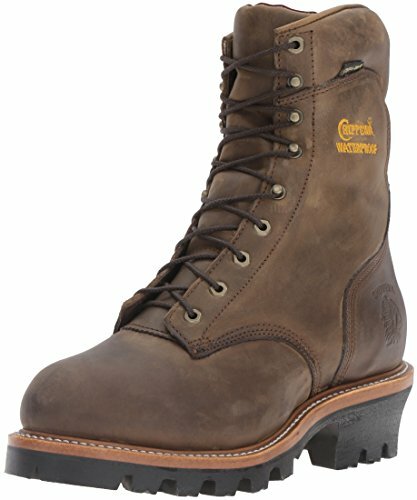 The Chippewa Men’s 9” Waterproof Steel-Toe Super Logger Boot is a mouthful to say, but so are the features available in the construction of this super boot. A synthetic slip-resistant sole is meant for traction on unstable terrain, where safety is of the utmost importance. Waterproofing on the boot and the bootie keep your feet warm and dry in the wet weather, and snow. Also, a triple ribbed steel shank along with speed hooks for easy lace-up provides comfortable support. Furthermore, these steel toe boots will protect your feet from impact and injury. These Chippewa boots can take a beating whether being subjected to rain, snow, sleet, or mud they hold up to every element thrown their way and still keep your feet warm and dry. The traction is undeniable. Even working on the ice, you remain stable on your feet. These boots are as comfortable as wearing a pair of tennis shoes, which in the line of work these boots are made for, is an extreme plus. They’re fairly pricey, and consumers might not want to spend that much on boots, however, when considering what they are made for, the added protection and safety features will undoubtedly protect your feet, whereas other lower end brands will not. This boot can fit tight at first, but we found that if you temporarily remove the inner sole for a day while wearing, it solves the problem. We believe these boots are made well for their purpose. For example, safety and durability through extreme weather conditions while keeping your feet warm and dry, is an asset. Though they may cost more than a typical work boot, it’s worth it to know your feet are enveloped and protected. These boots are highly recommended for those tough working men, in tough working conditions. 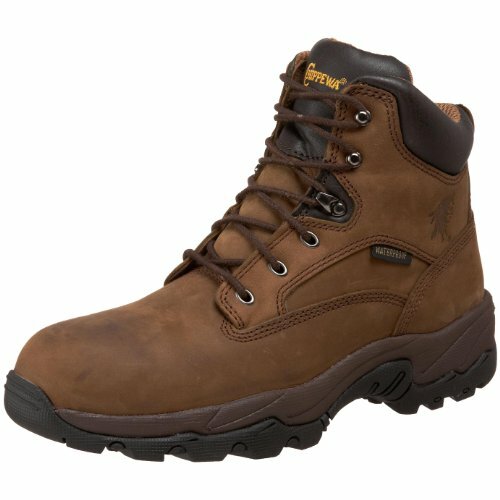 The Chippewa Composite Toe Waterproof Boot is perfect for those needing that extra protection outdoors in the weather. Equally important, a composite toe is a safety feature for those working in the field where the possibility of injury exists. This is a high-performance boot with traditional laces and thick sole with additional cushioning provides comfortable support. Added insulation keeps your feet warm and cool depending on the season. Can be used during a variety of different activities, they are not just your average work boots; they can be used for play as well, which makes them very versatile. This Chippewa style is considerably long lasting, even after continuous use and abuse on construction and landscaping sites. Composite toe really is an added bonus. It offers just enough protection from kicking things to dropping items, keeping your toes unscathed and out of harm’s way. Size runs a bit larger than expected so it’s suggested to select half size smaller, and if you need to return the boots, larger online stores such as Amazon have an excellent return policy and will replace them in a size that fits. Toes tend to slip from the back to the front, especially descending an incline. It’s suggested that you tie the laces tighter to prevent this from occurring. If you are looking for a multi-purpose boot that is not just meant for outdoor working environments, then these boots will serve you just fine. They are not only comfortable, but they are insulated and waterproof as well, which is ideal for someone who spends a lot of time outside in the weather. Though we wouldn’t recommend these boots for heavy construction that require extra safety, we do believe that these boots will stand up well for what they were made for. If you need more safety, check out our steel toe winter boots reviews. Remain safe and protected while you work, these hand-crafted, fully insulated with Shearling lining, waterproofed boots create a virtual climate controlled environment for your feet. In addition, a padded tongue and collar provide long-lasting comfort during the day. A high-abrasion Vibram lug sole with traction, grips to various surfaces with ease, allowing you to concentrate on your job instead of worrying about slipping. Heavy and bulky to some, however, you want a boot that is going to hold up to the elements, not something flimsy and cheaply made. Apparently, these boots are not kept in stock and they need to be specifically ordered. The only downfall we can see for this high-end boot is you might have to wait a little longer for them to arrive. You may check in some bigger stores like Amazon or Ebay. We consider this boot a good purchase, though we believe they are for consumers who require that added insulation and waterproofing. These boots are designed for extremely cold winter weather and can withstand being subjected to snow, ice, and rain without leakage. Yes, the boot is not cheap, but either is how it’s made. If you’re working outside in the elements and your feet depend on you than these are the boots are perfect. As you are aware, we only review brands that are top-quality. Consumers such as you rely on our expertise and honesty to give our personal opinions of the products that we list. We don’t waste your time on reviewing less than adequate brands of boots. Chippewa brand boots stand up to their tradition, offering only quality, and handcrafted products. As a result, they’ve earned one of the top spots on our list. We as a team, hope that our Chippewa boots reviews will help you make the best decision when it comes to the ideal boot type for your feet. If you can’t find what you are looking for, better visit our epic work boot reviews home page!